Special Containment Procedures: Instances of SCP-2189-T are to be kept in the low-security greenhouses at Biological Containment Site-103, with temperature, humidity and soil resembling the native conditions of their biological counterparts. Instances of SCP-2189-F are to be harvested when ripe, and the metals recycled. Special Containment Procedures (Updated █/█/██): Instances of SCP-2189-T are to be individually isolated in climate-controlled terraria at Bio Site-103. Temperature, humidity and soil resembling the native conditions of their biological counterparts are to be provided when instances of SCP-2189-F are required for research. At other times, a dormant state is to be induced. Class 6 hazmat procedures must be observed whenever entering the terraria or handling instances of SCP-2189-F.
Every 30 days, research staff are to collect dissection specimens from insect populations in the low-security greenhouses at Bio Site-103, as well as certain animal populations near SCP-2189's discovery site (see Document 2189-501 for details). Anomalous findings from dissection specimens are to be escalated to the Site Director. Special Containment Procedures (Updated █/█/██): Revision of █/█/██ is to remain in effect. Instances of SCP-2189-C are to be kept in cold storage at Bio Site-103 except during active research. Approximately 60% of the land under which SCP-2189-X is located has been purchased by Foundation front companies, with the remainder located under ██████ State Forest, which has been brought under effective Foundation control through infiltration of relevant parks administration offices. Outpost-103-47 has been established in the area for observation and research. Locating PoI-2189-1 has been designated an Alpha-level priority. Description: SCP-2189 is the collective designation for three items superficially resembling specimens of Malus domestica (AKA an apple tree, designated SCP-2189-T-1), Vitis vinifera (AKA a common grape vine, designated SCP-2189-T-2) and Musa acuminata (AKA a banana plant, designated SCP-2189-T-3), as well as their associated fruit (designated SCP-2189-F-1, -2, and -3, respectively). The bark, epidermis, and peels of SCP-2189 instances are indistinguishable from that of their non-anomalous counterparts, including genetically. However, in place of the expected internal structures are an intricate network of gears, springs, cams, and cranks. Removed components are indistinguishable from non-anomalous metals, mostly brass. When its internal mechanisms are functioning, instances of SCP-2189-T respond to their environment similarly to their biological counterparts, except that they are always in growing season, and parts do not naturally senesce: leaves never change color and fall off, bark never sloughs off, and instances of SCP-2189-F remain attached indefinitely and do not become overripe. SCP-2189-T instances have the same needs as their non-anomalous counterparts in terms of water, sunlight, and soil type. When deprived of these, the instance's internal mechanisms begin to slow, eventually stopping altogether under circumstances corresponding to severe malnutrition. If appropriate exposure to sunlight, water, and soil are resumed, the instance resumes functioning. 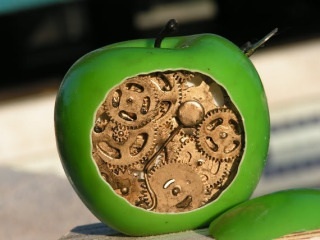 The internal mechanisms of an SCP-2189-F instance will cease functioning if it is picked before ripe, or once it has been separated from the corresponding SCP-2189-T instance for about the same amount of time it would take its biological counterpart to spoil. Functioning instances of SCP-2189-F can be eaten and digested. Subjects report that the flavor and texture are typical of the type of fruit corresponding to the instance. Juices dripping from an SCP-2189-F instance incidental to being consumed are identical to non-anomalous counterparts.1 Mechanisms that are bitten through will continue their normal movement, with portions of the mechanism moving from the main mass to the bitten-off piece and back again, as if the mechanism were still intact. This spatial anomaly appears to continue on an increasingly small scale as SCP-2189-F pieces are further broken down in the mouth and digestive tract. If the peel of an SCP-2189-F instance is removed, the mechanical interior will continue to function. However, if anything other than animal mouthparts penetrates deeper than the peel of an SCP-2189-F instance, the internal mechanisms of that instance will jam. Once this occurs, all portions of the instance will cease to function as fruit. The mechanisms can no longer be bitten through, and bites already taken will become indigestible. Consequent autopsies of animal and D-class test subjects identified either gastrointestinal trauma or copper toxicity as the cause of death, depending on the stage of digestion. Addendum 1: One of the early test subjects of SCP-2189, D-51259, was subsequently assigned to be [REDACTED] for SCP-███, and consequently had her termination deferred by three months. When SCP-███ attempted to remove [REDACTED] D-51259 was given a detailed autopsy with biopsies of all tissues. This unusually thorough postmortem analysis was standard practice for all D-class who had been used to test SCP-2189, and the directive remained in D-51259's personnel file despite the fact that active testing of SCP-2189 had been concluded. Microscopic brass gears were discovered in some samples of D-51259’s adipose and lymphatic tissue, and her liver was found to contain a cluster of five interlocked gears ranging in diameter from 0.1-0.4mm, the largest of which was attached to a 0.3mm-long camshaft. These structures were not found in D-class personnel who died during or shortly after testing of SCP-2189. Testing of SCP-2189 has resumed and a proposal to reclassify as Euclid is currently being drafted by the research team. Addendum 2: Subsequent to SCP-2189's reclassification, Field Agents Dietrich and Harris conducted a review of public and police records to identify deaths and missing person cases potentially linked to SCP-2189. They flagged for investigation the disappearance of L███ R████, a retired aerospace engineer who lived in a cabin several miles from ██████ State Forest, where SCP-2189 was discovered. Upon entering R████'s home, the Agents discovered over three dozen clocks and watches. All of those that retained legible manufacturer markings were later identified as being of purely mechanical design, without electrical components. Approximately two dozen of the timepieces were found with their outer components (casings, faces, etc.) in a state of extreme corrosion inconsistent with their apparent date of manufacture and conditions of storage. These instances lacked internal components, and were covered in mold. Fourteen instances were found in R████'s deep freeze. These instances had uncorroded exteriors, and contained a multicolored biological material later identified as a patchwork of various tissues found in Malus domestica, Vitis vinifera, and Musa acuminata. These instances were found to be keeping accurate time despite their lack of internal mechanisms. Agents also confiscated numerous hand-written notebooks containing diagrams and arrays of symbols. Analysis of the notebooks has been hindered by mold damage, but the legible portion of the text includes common equations from mechanical engineering with unidentified symbols inserted in place of various constants. The timepieces have been designated SCP-2189-C, and L███ R████ has been designated Person of Interest 2189-1. Addendum 3: Agents Dietrich and Harris interviewed several of PoI-2189-1's superiors and coworkers at ██████ Aeronautics, where he was employed for 32 years. PoI-2189-1 appears to have been socially isolated and regarded as increasingly eccentric during the final years of his employment. He was reportedly pushed into retirement when he began talking openly about the "engineering applications" of various occult practices, most frequently “sacred geometry and geography." Researchers conducted a thorough geological survey of the property. Subterranean mapping of the area was hampered when standard GPR2 was unable to produce clear output. A [[REDACTED]] system was employed, which identified a metallic sphere approximately ██ m in diameter, buried at a depth of ███ m, and connected by a curved shaft to a much larger object at the limit of the [[REDACTED]]'s range. Probing of the surrounding region was conducted under cover of a study by the U.S. Geological Survey, and the central mass was found to be connected to similar spheres as far away as ██████, ranging in diameter from ██ m to 0.█ km. The overall structure of the object resembles an orrery, buried in a vertical orientation roughly along the line of latitude at ██°██' N.
A mineral exploration drilling rig with diamond drill bits successfully penetrated the sphere closest to the surface and extracted a core sample. The interior layers consisted of tissues found in disparate human body parts, including layers made of heart muscle, tendons, and neurons. The outer shell was found to be brass. The structure has been designated SCP-2189-X. It works, Johnny-boy! It works. Every part of it works. I did as tough a test as I could think of short of the real thing. Complex systems, groups of, you know, groups of complex systems, one of the earth and one clean and mechanical, matching the [unintelligible] function versus structure, and it all fell into place, like clockwork, perfectly engineered! Smooth and perfect! You do the right things, and the right things will happen! You can't laugh at the rules of the universe like some political middle manager bullshitter [unintelligible] and expect to get away with it! It's not a theory, it's not hoodoo, it's sacred geometry and geography! [laughs] I really wish you were here to see it. Oh, I know you think I'm crazy too, Johnny-boy, but you've been the only one to stand by me, and I want you to know that in the world to come, you and Sherry will be protected. You'll sit at my right hand. The Sleeping King will never wake up, Johnny-boy. I will. Further invasive testing of SCP-2189-X was prohibited and SCP-2189 upgraded to Keter by order of O5-█. I don't need to tell you that we got caught with our pants down on this one, or that we might well have remained in the dark for far longer if an accidental discovery hadn't forced you to take a second look at SCP-2189. The simple step of assigning Agents to investigate the SCP's origins at the time of containment could have been a real game-changer. Instead, SCP-2189 spent critical months mis-classified as Safe, with no one looking into it, because no one in Site-103's chain of command – not your project head, not your director of research, and not you – thought that it might be worthwhile to study the long-term effects of eating an SCP. That kind of incurious attitude is the exact opposite of what we pay researchers for. And your claim that you couldn't assign investigative resources until SCP-2189 was reclassified as Euclid won't fly. You have a discretionary budget for precisely this reason. We still don't know exactly what R████ did, whether he got what he wanted, or for that matter whether the effects of his little dress rehearsal are still working their way up the food chain in █████ and your own Site's greenhouses. What we do know for certain is that we gave him a three-month head start. In light of these events, I've decided your talents would be better utilized elsewhere in the organization. You are relieved of your duties as Site Director, effective immediately. 1. Attempting to squeeze or ream an instance to produce additional juice will result in jamming of the internal mechanisms, as described below.